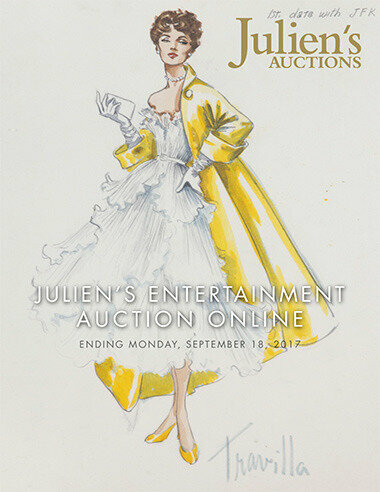 La vente aux enchères "Julien's Entertainment" du 18 septembre 2017 par Julien's Auction organisée exclusivement sur internet, contenait 175 lots sur le cinéma d'hier et d'aujourd'hui mais aussi sur le rock n'roll. 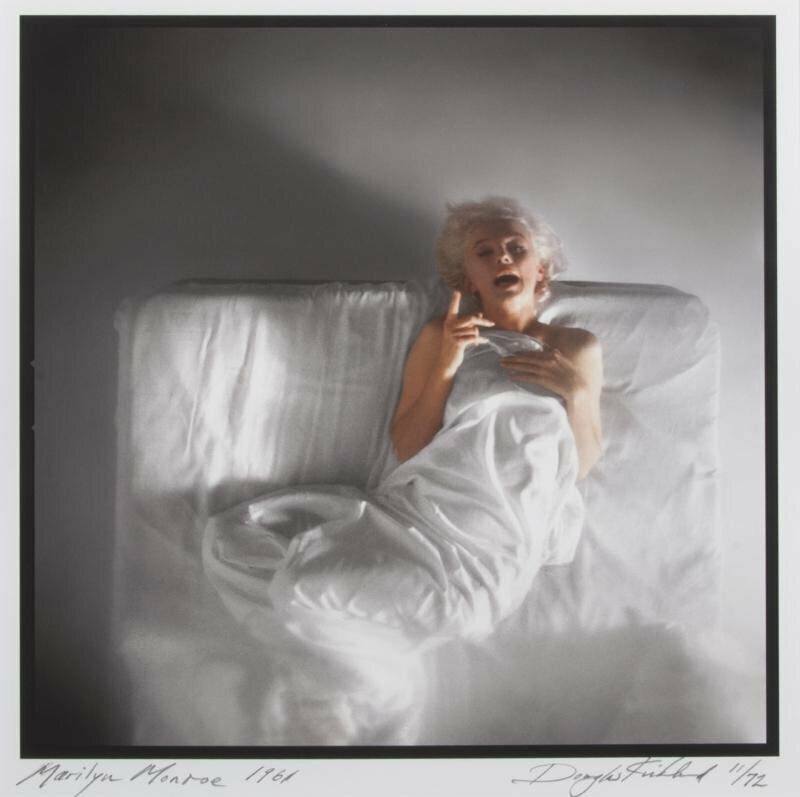 Il contenait 8 lots sur Marilyn Monroe (en consultation sur julienslive): deux chèques et des photographie. A print depicting Marilyn Monroe as Venus at her bath surrounded by three putti, signed by artist at lower right and numbered 20/1000 at lower left. 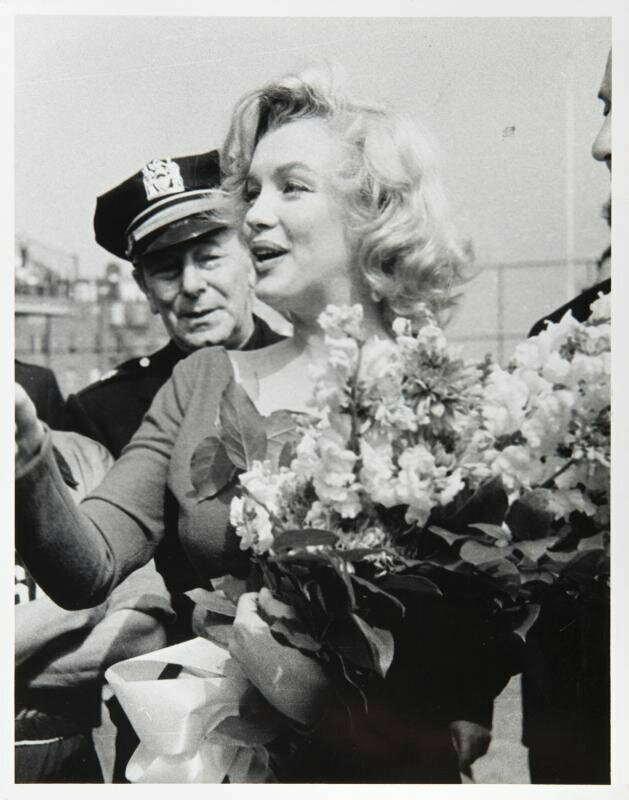 A Marilyn Monroe signed counter check written on behalf of Marilyn Monroe Productions Inc. on November 15, 1959, to Jurgensen’s Gourmet in the amount of $26.21. 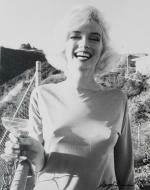 A Marilyn Monroe signed check dated December 19, 1953, to Greenblatt’s in the amount of $8.50. 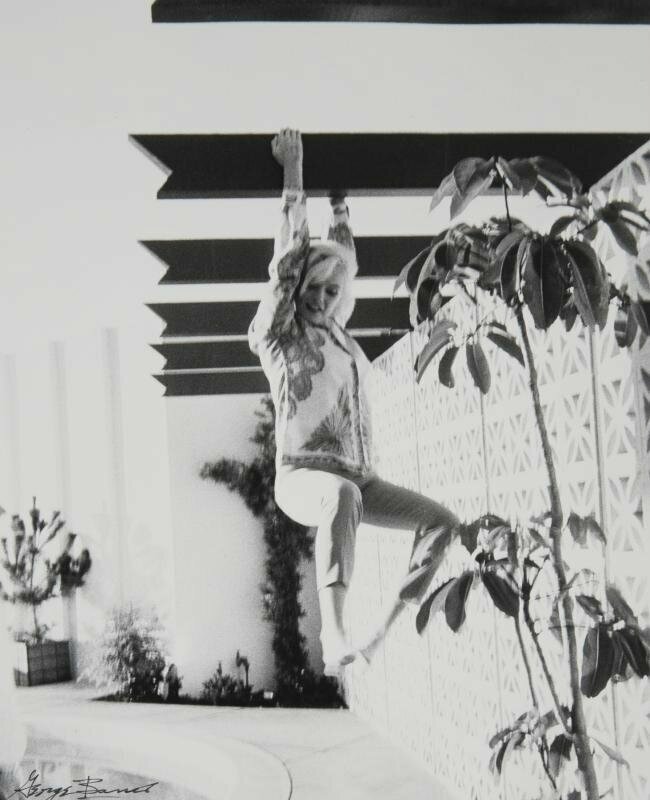 Greenblatt’s Deli is located on Sunset Boulevard in Hollywood. 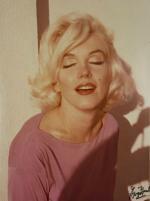 An archive of approximately 60 vintage wardrobe test shots of Marilyn Monroe. 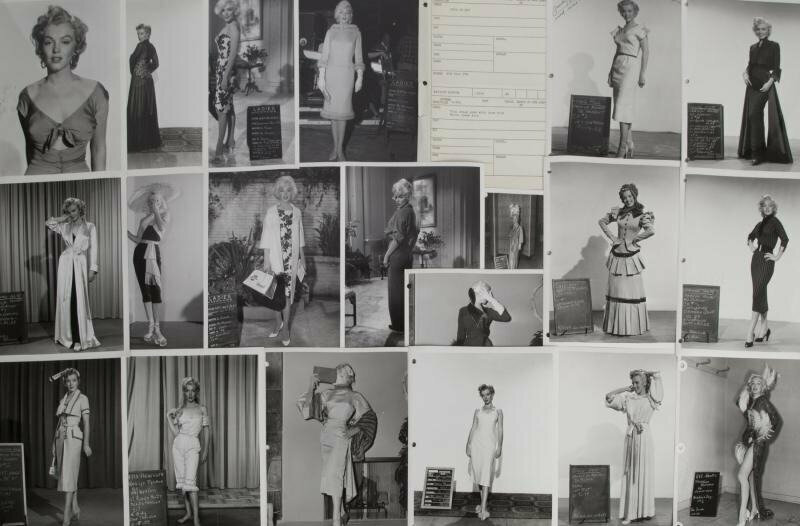 Accompanied by a wardrobe sheet for Monroe's character from A Ticket To Tomahawk (20th Century, 1950). 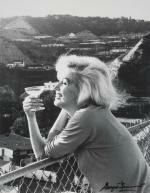 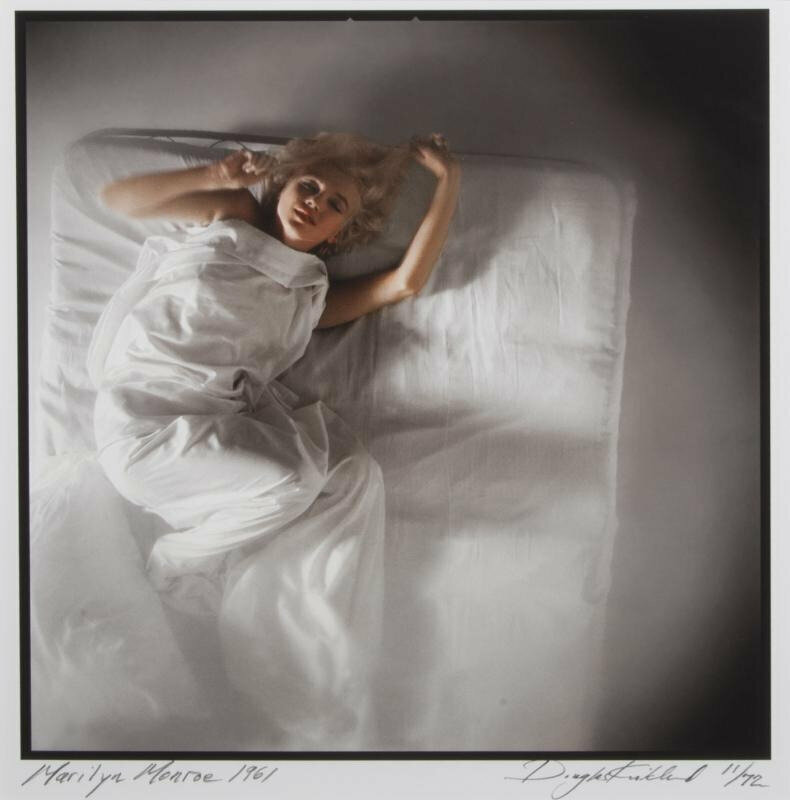 An archive of approximately 100 studio images of Marilyn Monroe. 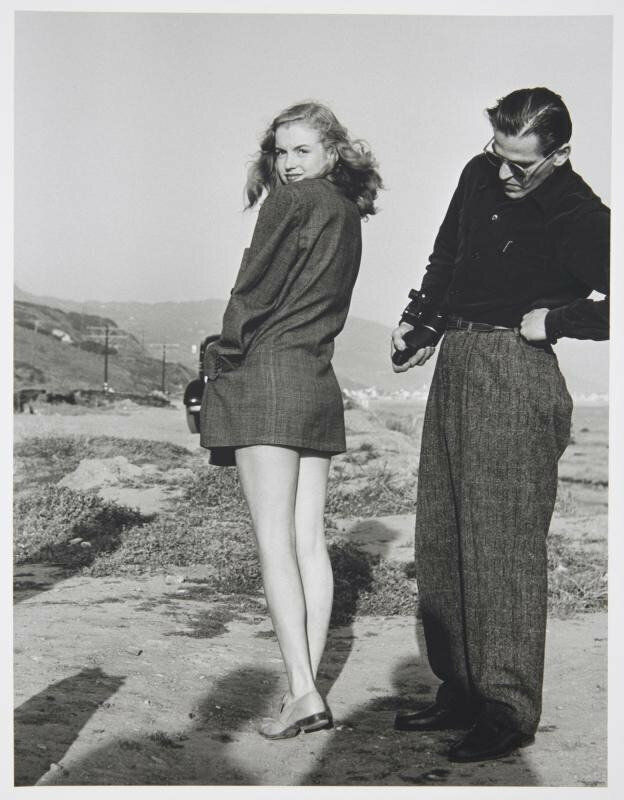 The archive includes original vintage studio images, reprints, and some copies. 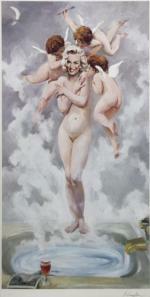 Some images have studio stamps or snipes affixed to verso. Accompanied by a binder with approximately vintage tear sheets and magazine covers featuring Marilyn Monroe. 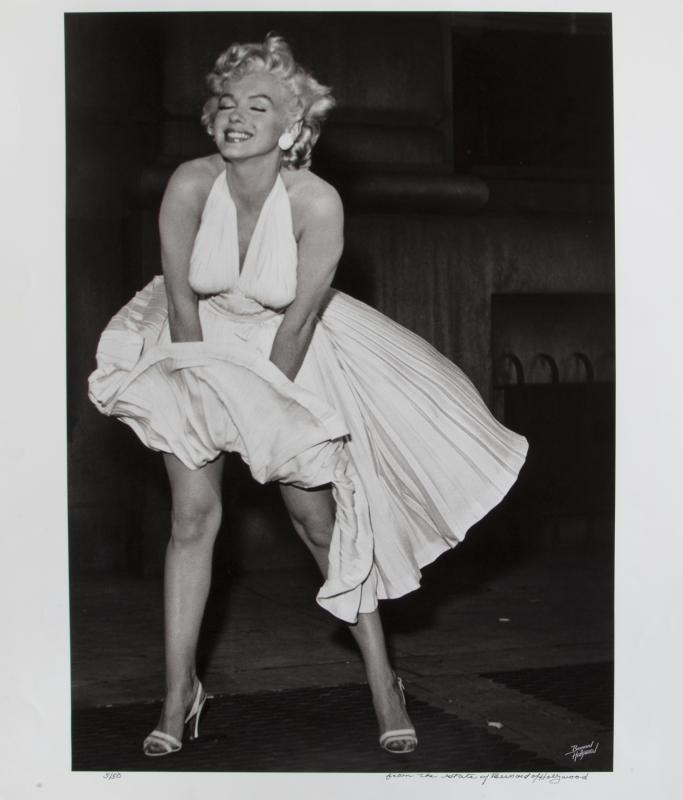 A limited edition black and white photograph of Marilyn Monroe taken by Bruno Bernard on the set of The Seven Year Itch (20th Century, 1955), numbered 5/50 and signed by The Estate of Bruno Bernard at lower right corner. 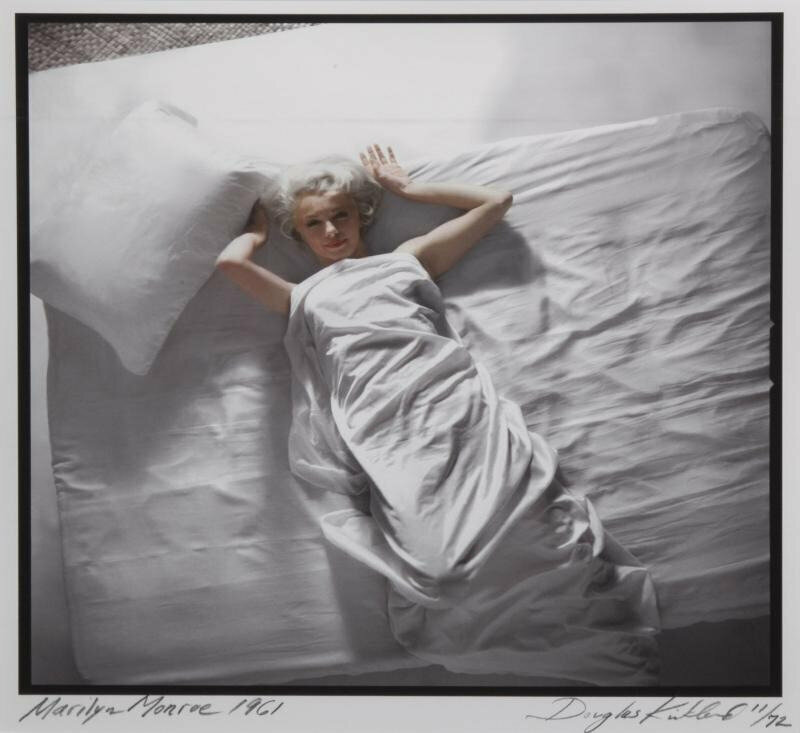 A black and white image of Marilyn Monroe taken by Joseph Jasgur in 1946, printed later with Jasgur's approval. 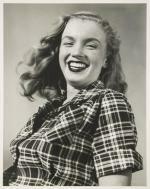 The image shows Monroe in a plaid shirt smiling at the camera. 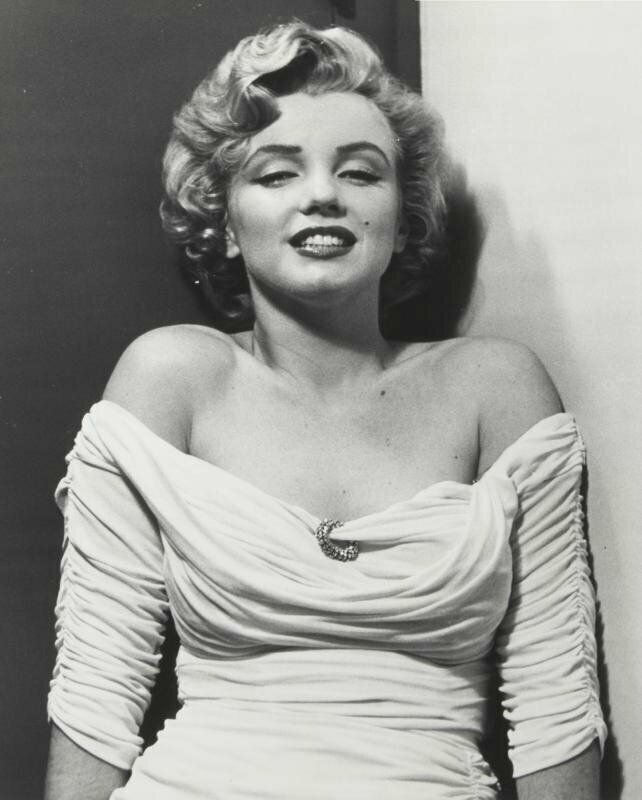 A black and white image of Marilyn Monroe taken by Joseph Jasgur in 1946, printed later with Jasgur’s approval. 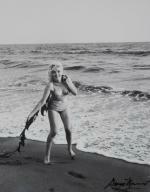 The image was taken during a session at Zuma Beach. 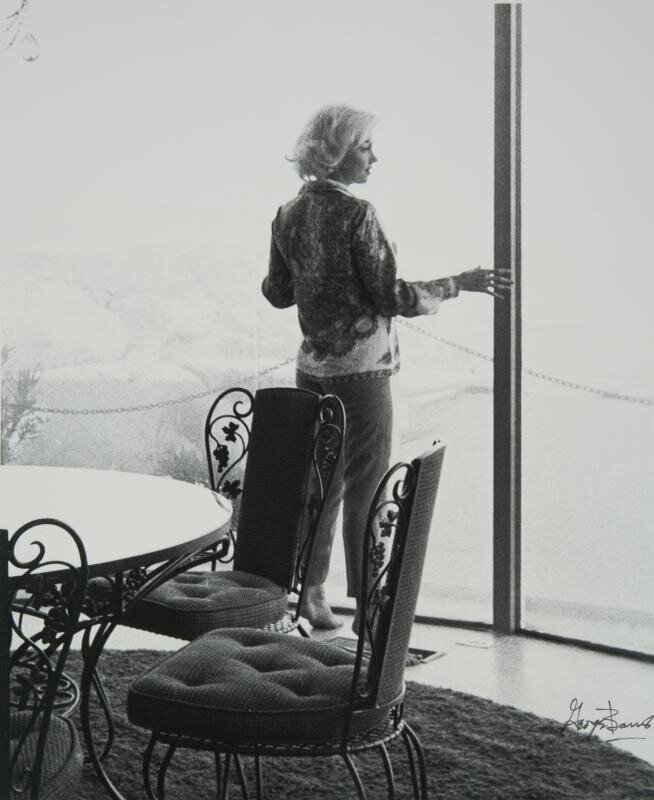 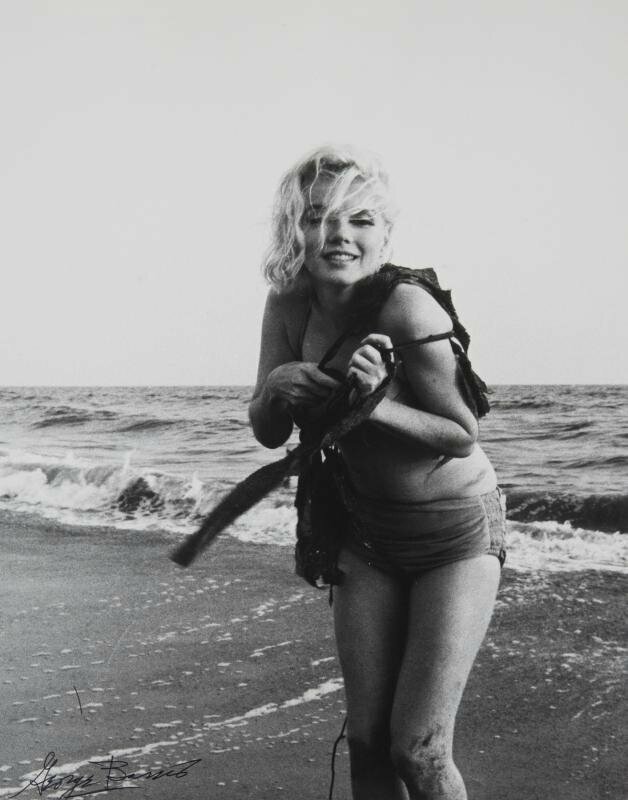 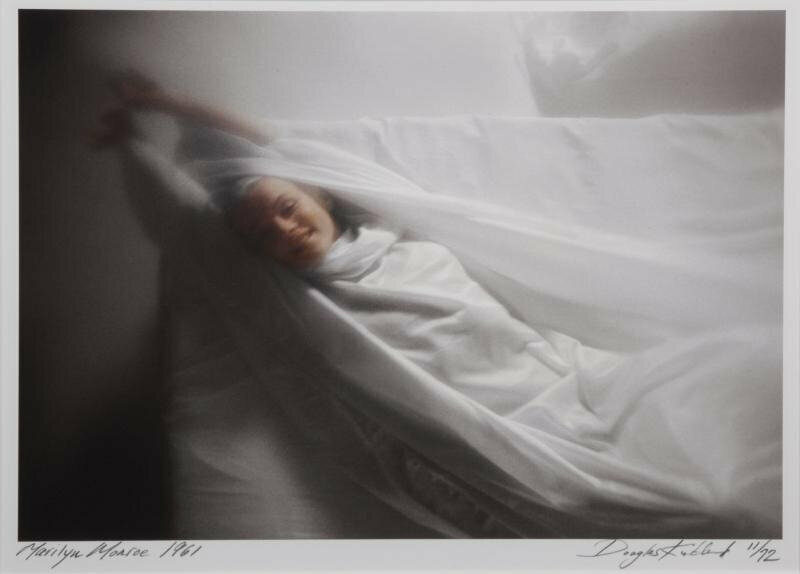 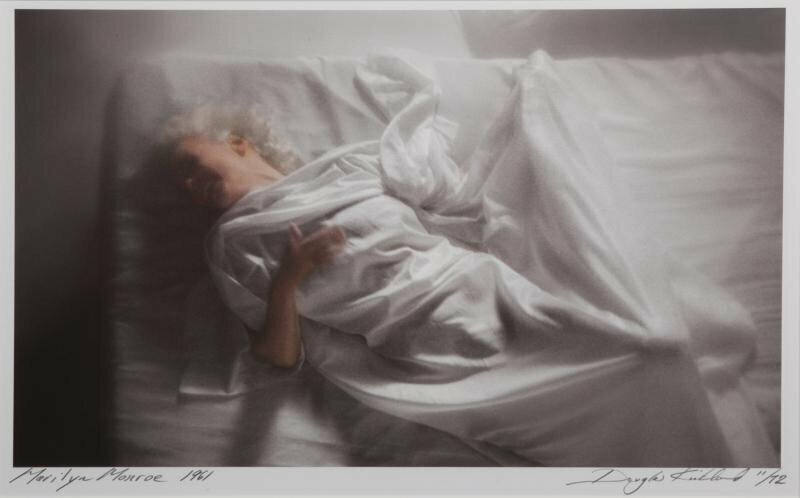 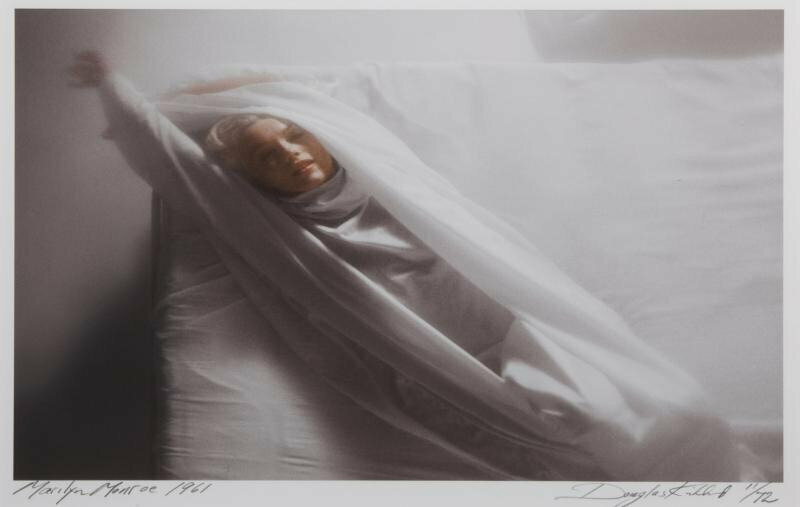 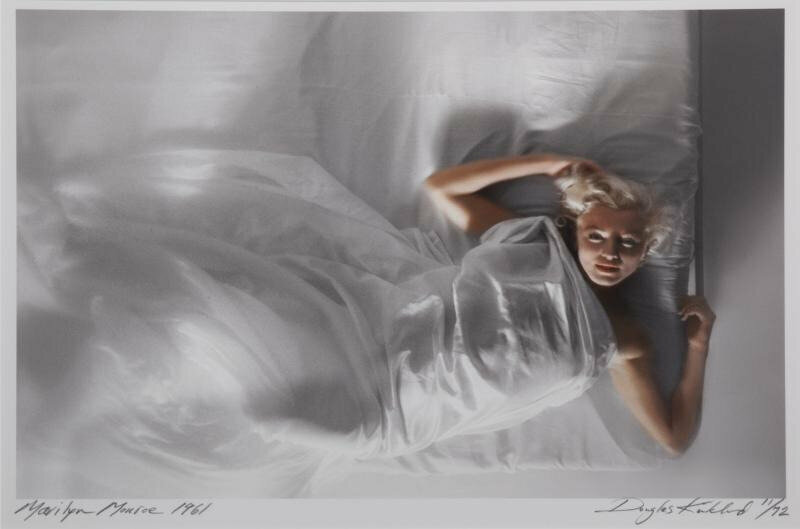 La vente aux enchères "Iconic Imagery of Marilyn Monroe" du 13 août 2017 par Julien's Auction organisée exclusivement sur internet, contenait 67 lots sur Marilyn Monroe (en consultation sur julienslive): des photographies de Douglas Kirkland, George Barris, Philippe Halsman, Andre De Dienes, Bruno Bernard; ainsi que deux chèques signés par Marilyn. 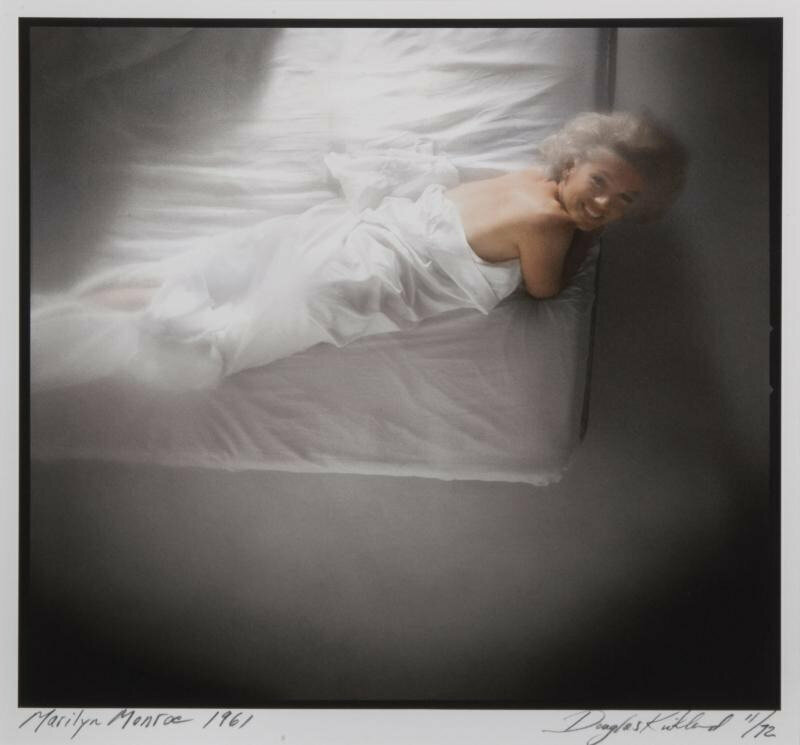 A color ink-jet photograph of Marilyn Monroe taken by Douglas Kirkland in 1961. 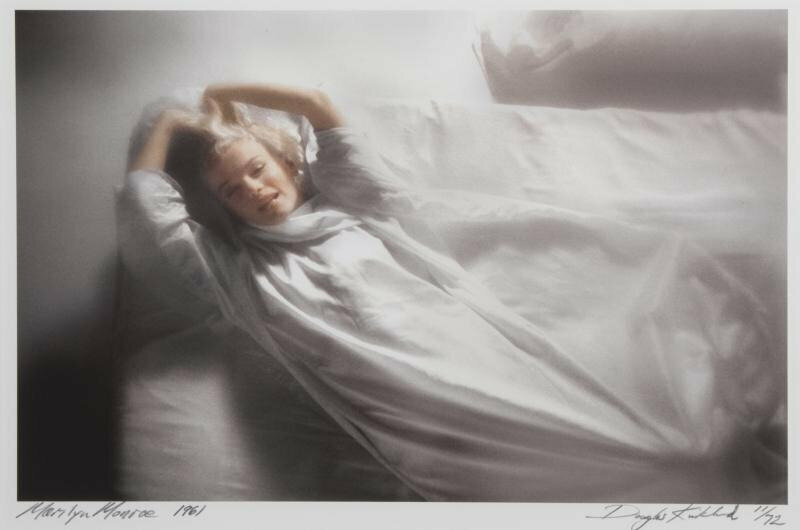 The photograph is signed by Kirkland at lower right and numbered 11/72. 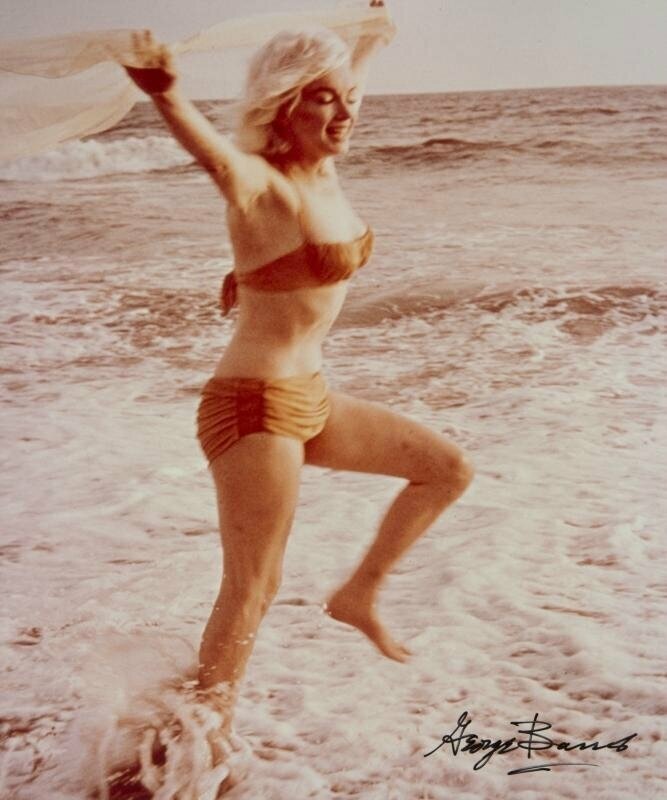 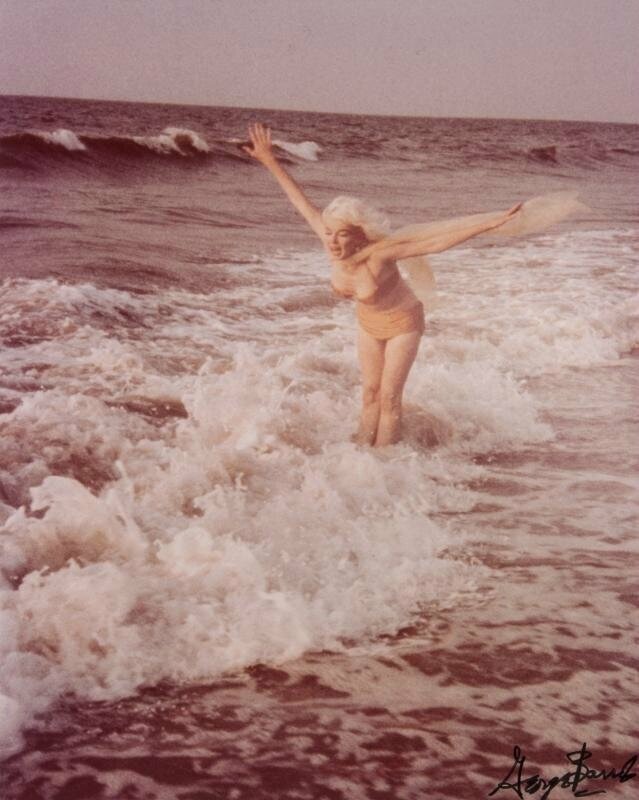 A color photograph of Marilyn Monroe taken by George Barris in 1962. 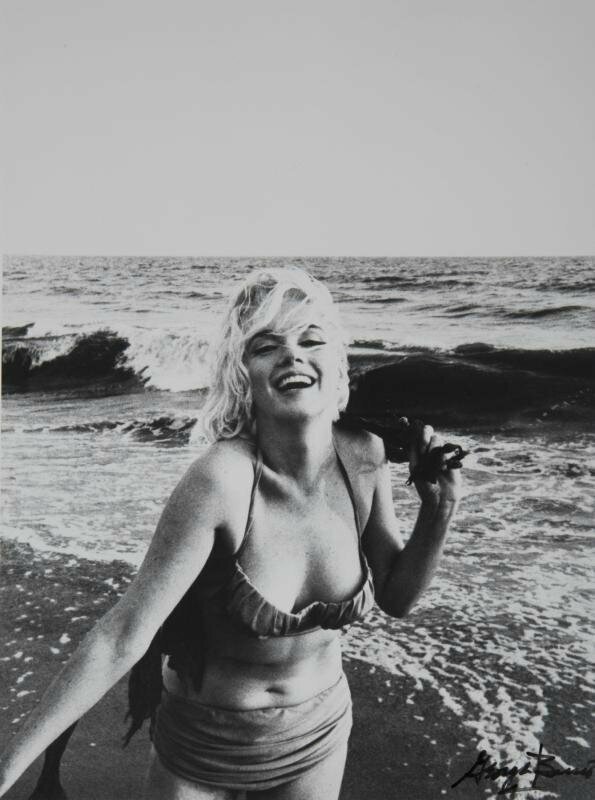 The photograph is signed by Barris at lower left and stamped on verso “© George Barris/ Marilyn Monroe/ Weston Editions LTD./ All Rights Reserved.” 1987 marked the 25th anniversary of this photoshoot with Monroe. A color photograph of Marilyn Monroe taken by George Barris in 1962. 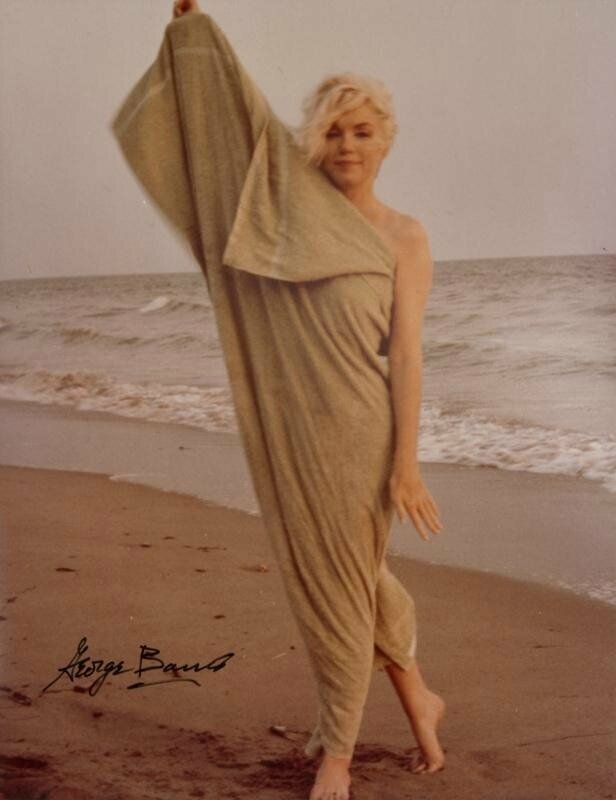 The photograph is signed by Barris at lower right and stamped on verso “© George Barris/ Marilyn Monroe/ Weston Editions LTD./ All Rights Reserved.” 1987 marked the 25th anniversary of this photoshoot with Monroe. 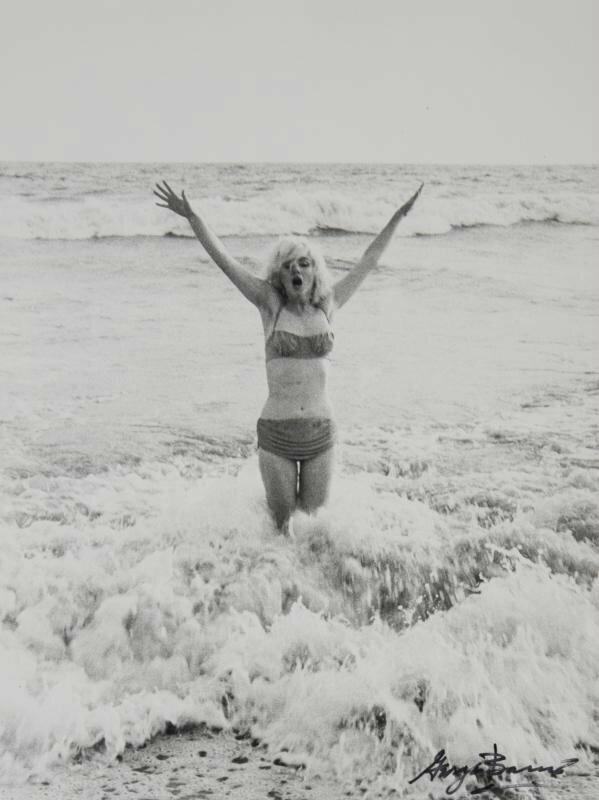 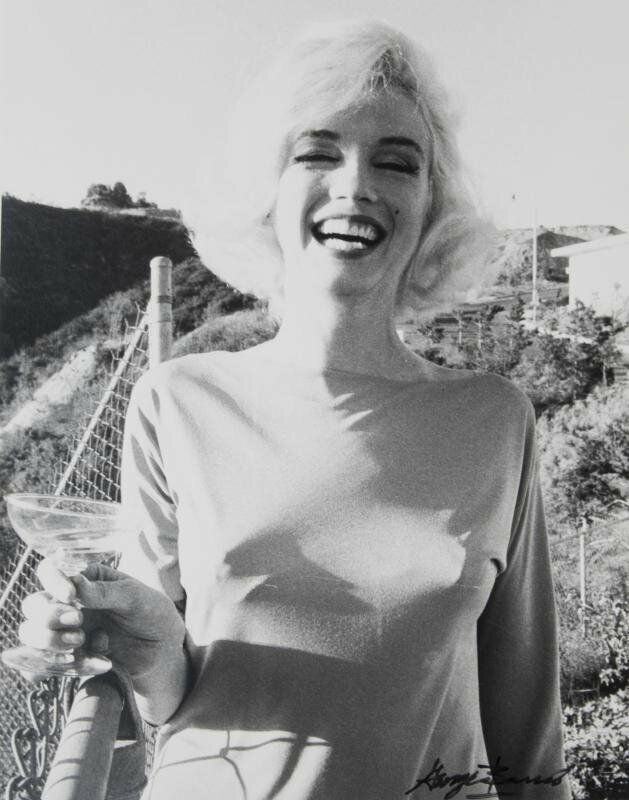 A black and white photograph of Marilyn Monroe taken by George Barris in 1962. 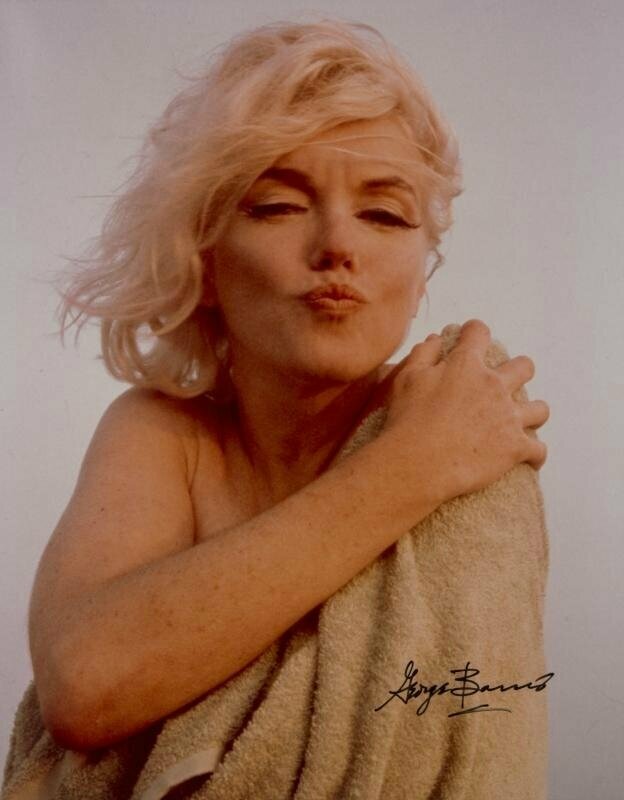 The photograph is signed by Barris at lower left and stamped on verso “© George Barris/ Marilyn Monroe/ Weston Editions LTD./ All Rights Reserved.” 1987 marked the 25th anniversary of this photoshoot with Monroe. 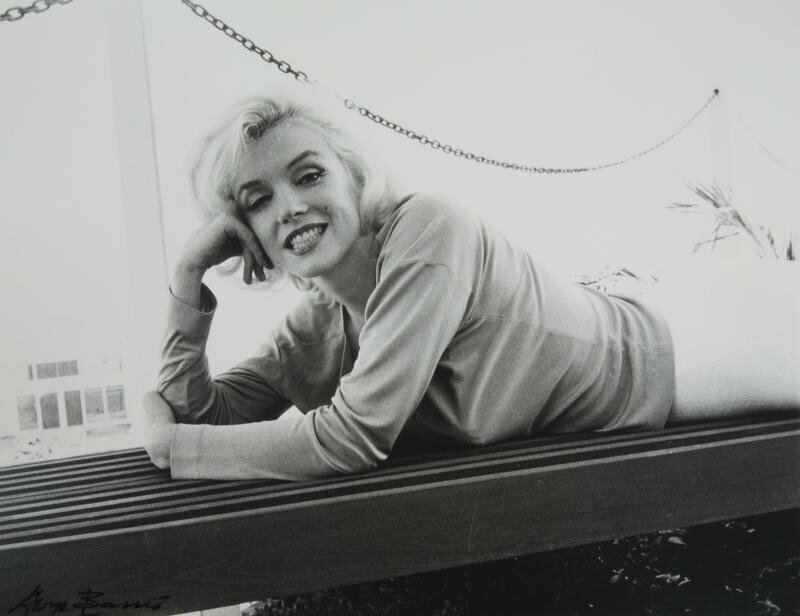 A black and white photograph of Marilyn Monroe taken by George Barris in 1962. 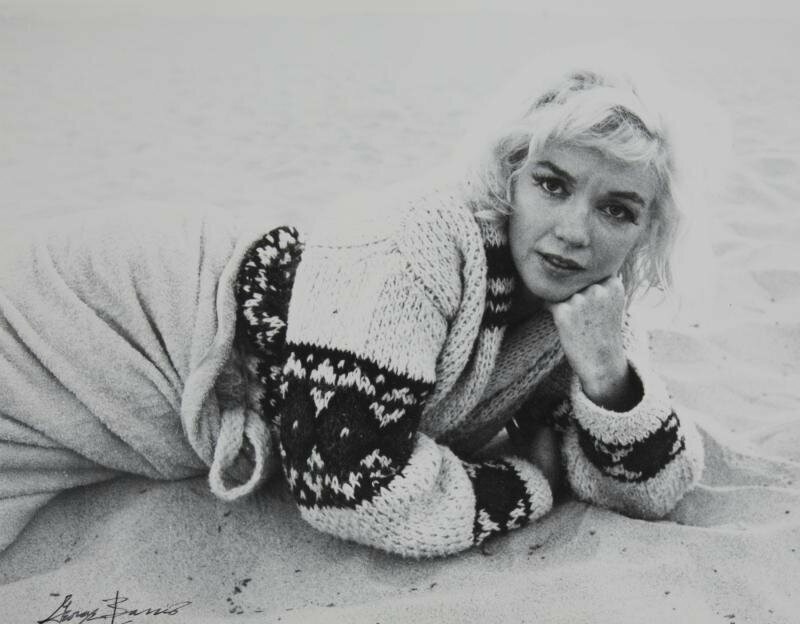 The photograph is signed by Barris at lower right and stamped on verso “© George Barris/ Marilyn Monroe/ Weston Editions LTD./ All Rights Reserved.” 1987 marked the 25th anniversary of this photoshoot with Monroe. 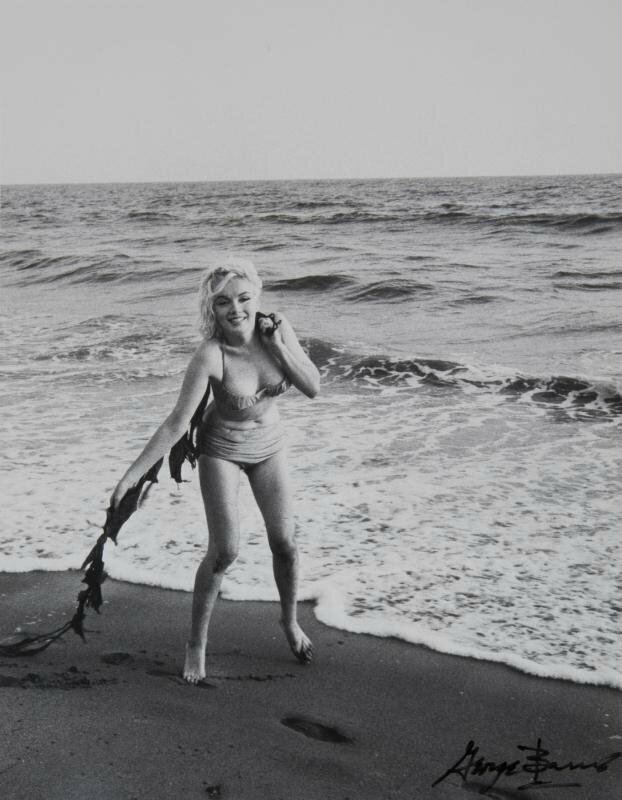 A black and white photograph of Marilyn Monroe taken by George Barris in 1962. 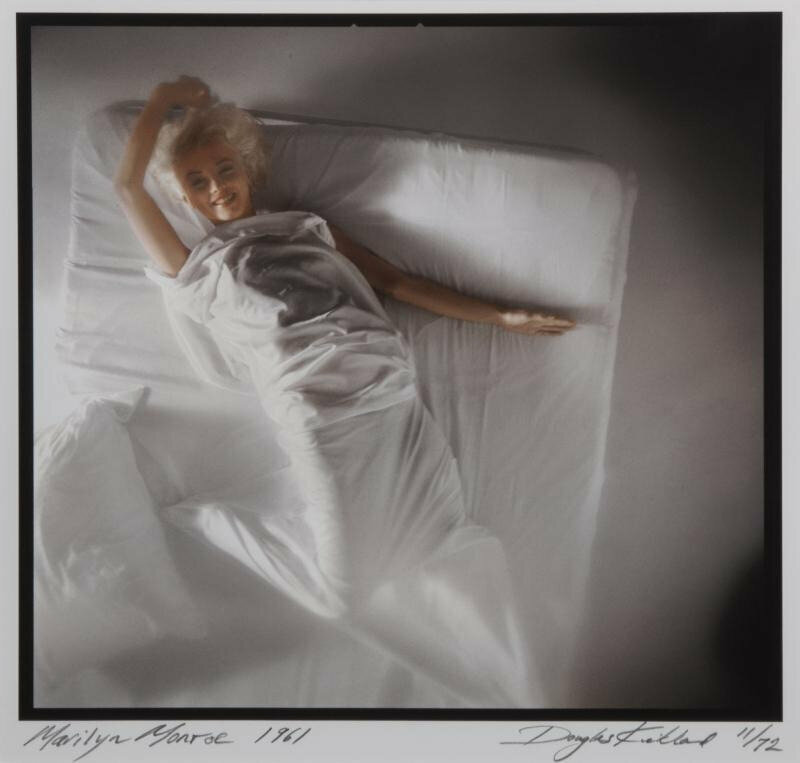 The photograph is signed by Barris at lower right with copyright language at right that reads “© 1987 Marilyn Monroe Weston Editions Ltd.” Additionally stamped on verso “© Copyright 1987 George Barris/ Marilyn Monroe/ Weston Editions LTD.” 1987 marked the 25th anniversary of this photoshoot with Monroe. 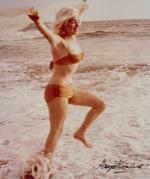 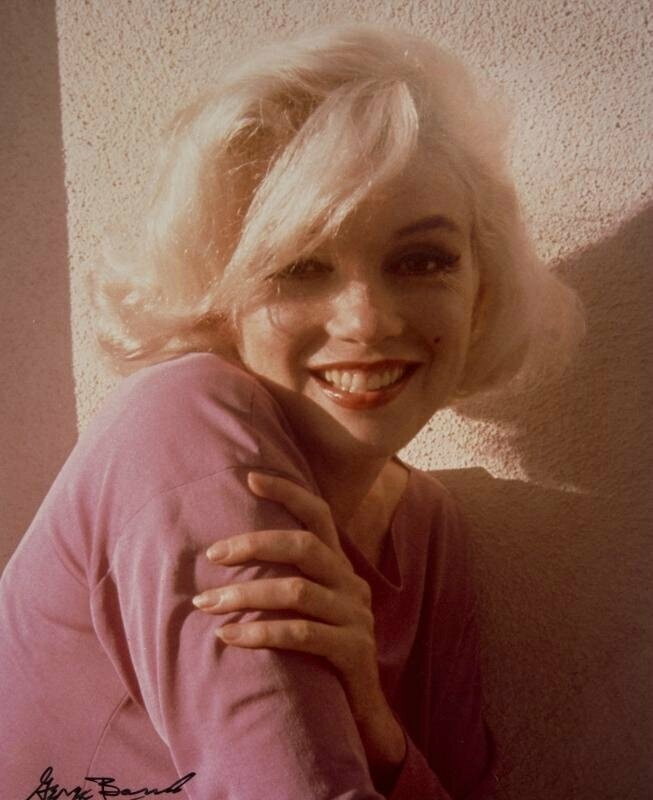 A color photograph of Marilyn Monroe taken by George Barris in 1962. 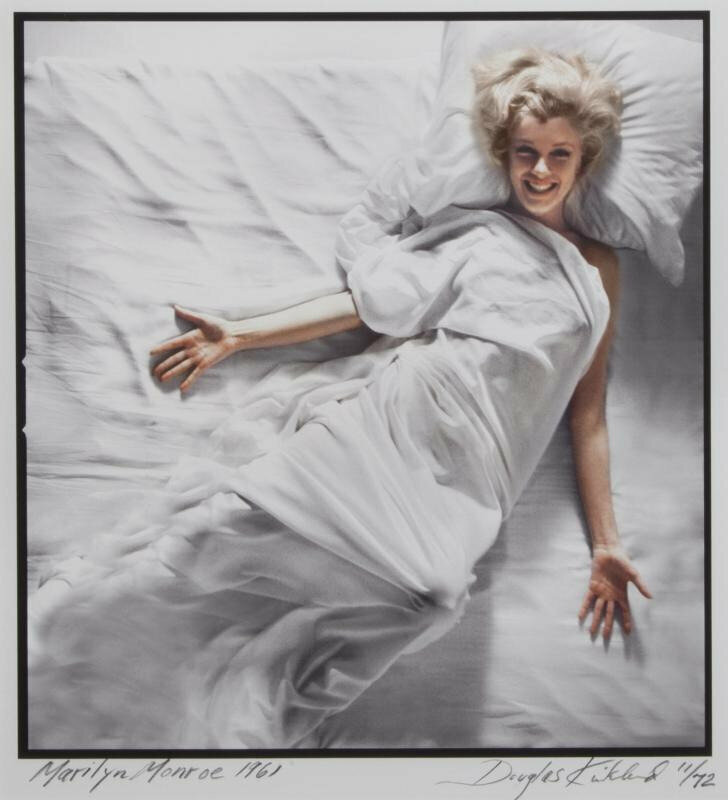 The photograph is signed by Barris at lower right and stamped on verso “© Copyright 1987 George Barris/ Marilyn Monroe/ Weston Editions LTD.” 1987 marked the 25th anniversary of this photoshoot with Monroe. 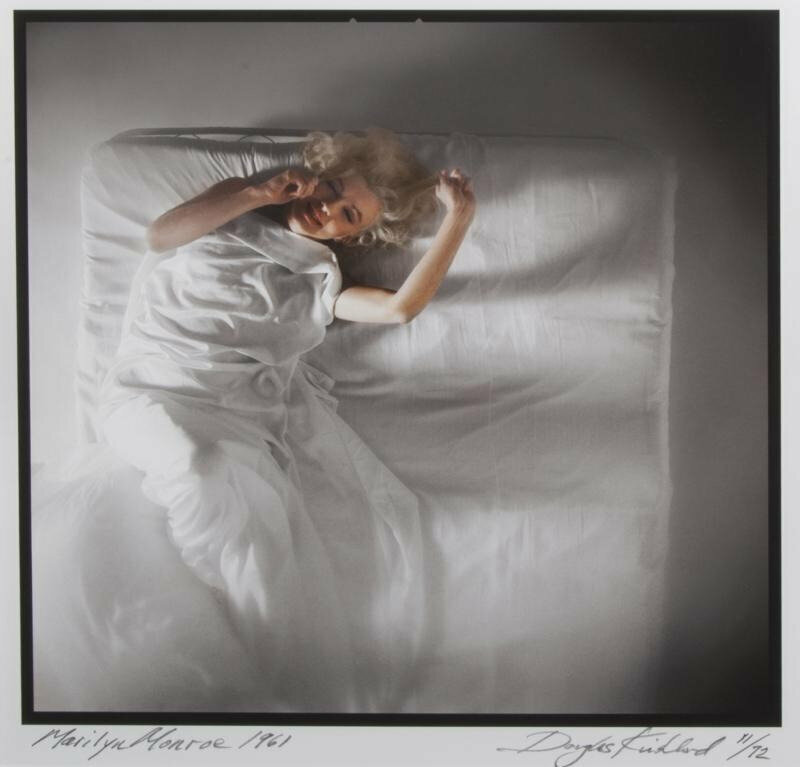 A black and white photograph of Marilyn Monroe taken by Philippe Halsman in 1952 and printed by Halsman's estate as part of a limited edition in 1981. 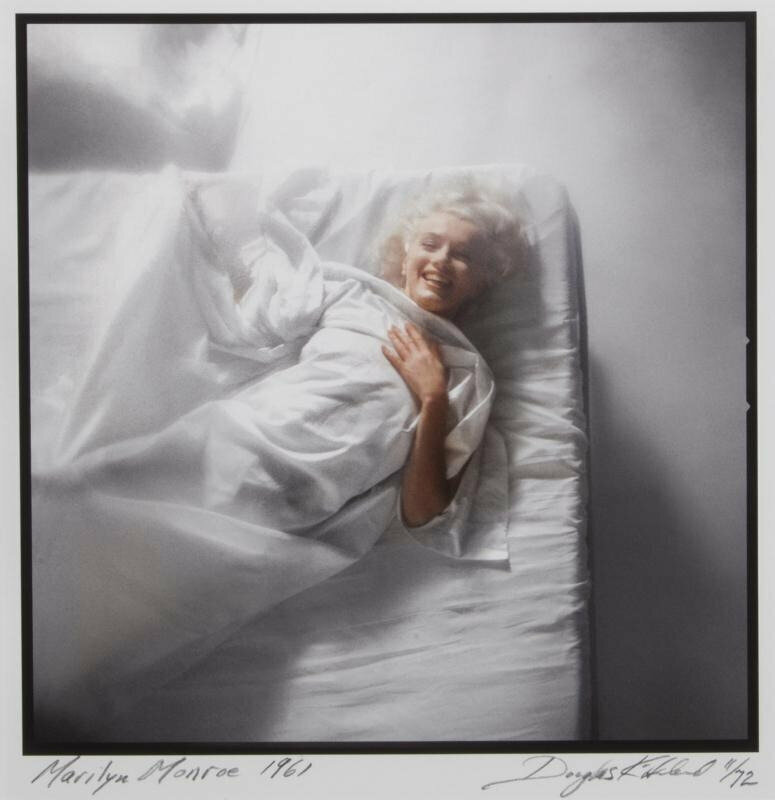 Halsman/Marilyn copyright credit stamp on verso with edition number 181/250. 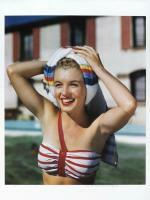 The photograph appeared on the April 7, 1952, cover of LIFE magazine. 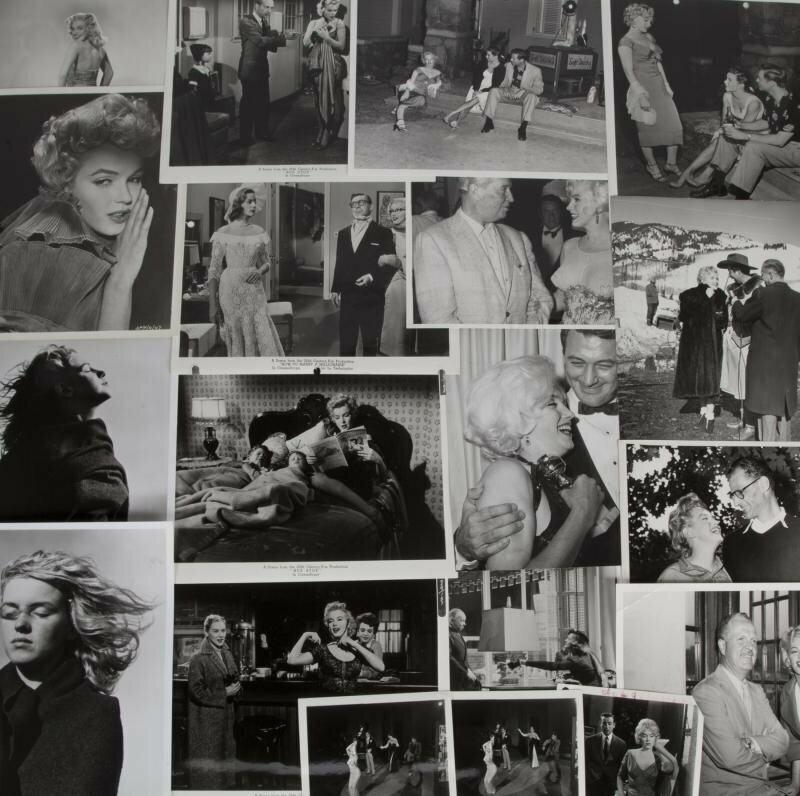 Lot 57: MARILYN MONROE "THE TRUE MARILYN"
A black and white photograph collage of Marilyn Monroe composed of images taken by Philippe Halsman in 1954. 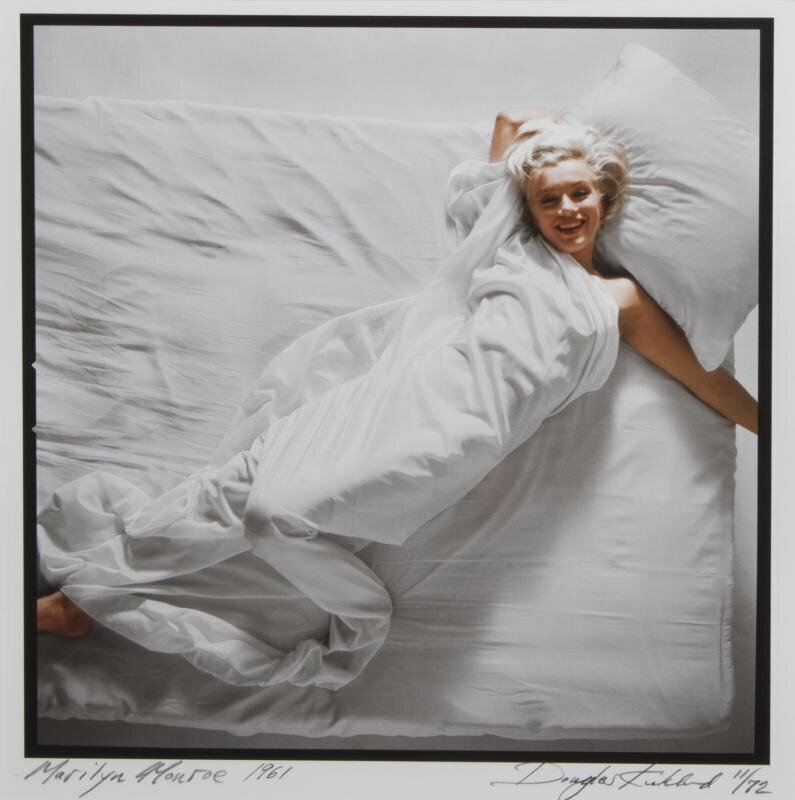 The collage was printed by Halsman's estate as part of a limited edition in 1981 and titled “The True Marilyn.” Halsman/Marilyn copyright credit stamp on verso with edition number 173/250. A black and white photograph of Marilyn Monroe taken by Philippe Halsman in 1952. 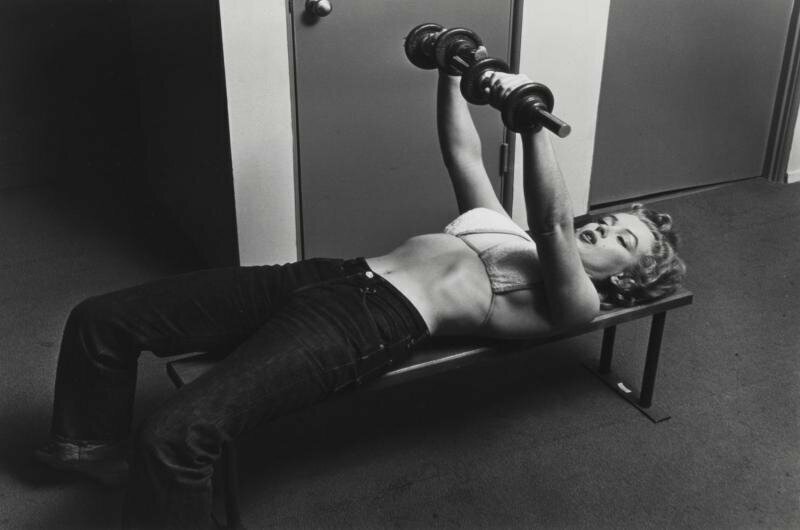 The image, which shows Monroe lifting barbells, was printed by Halsman's estate as part of a limited edition in 1981. 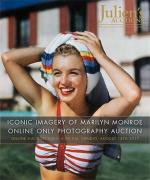 Halsman/Marilyn copyright credit stamp on verso with edition number 184/250. 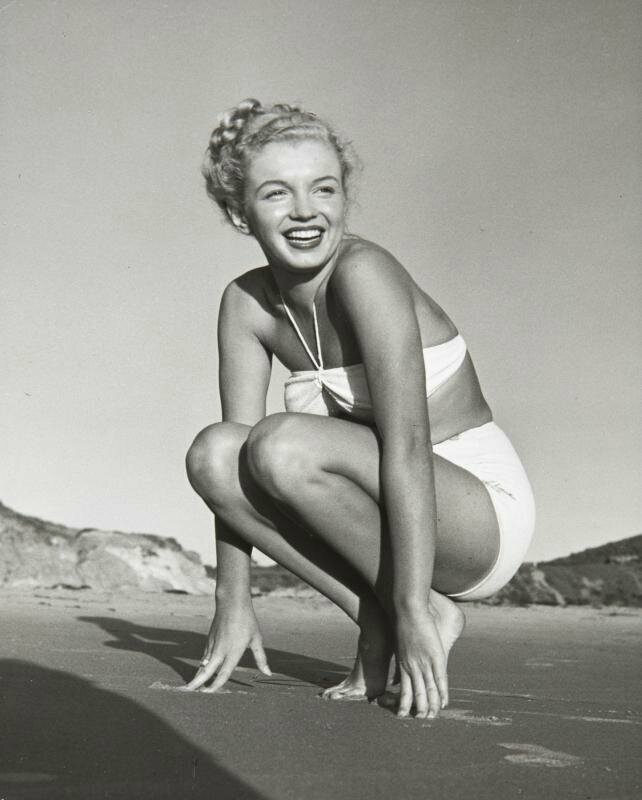 A vintage black and white photograph of Marilyn Monroe taken by Andre de Dienes in 1945. 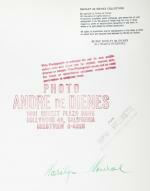 Photographer's stamp on verso. 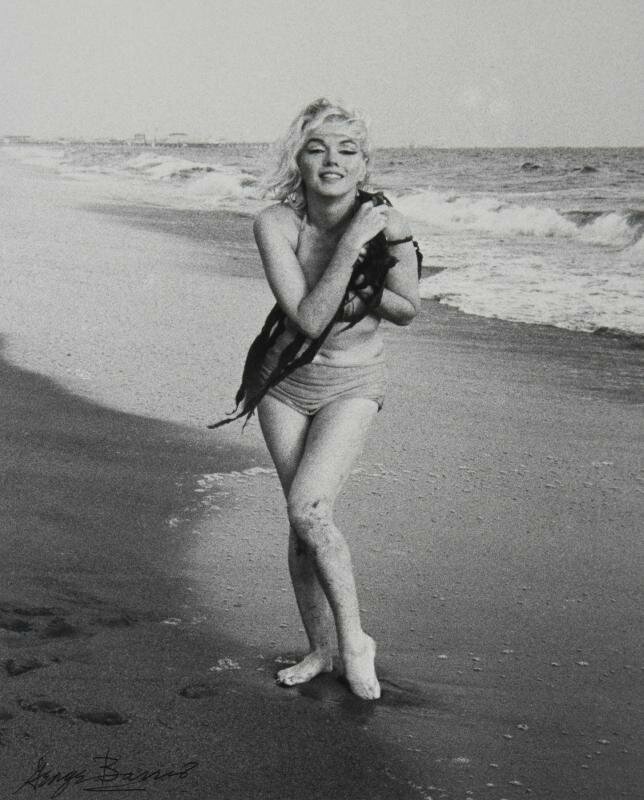 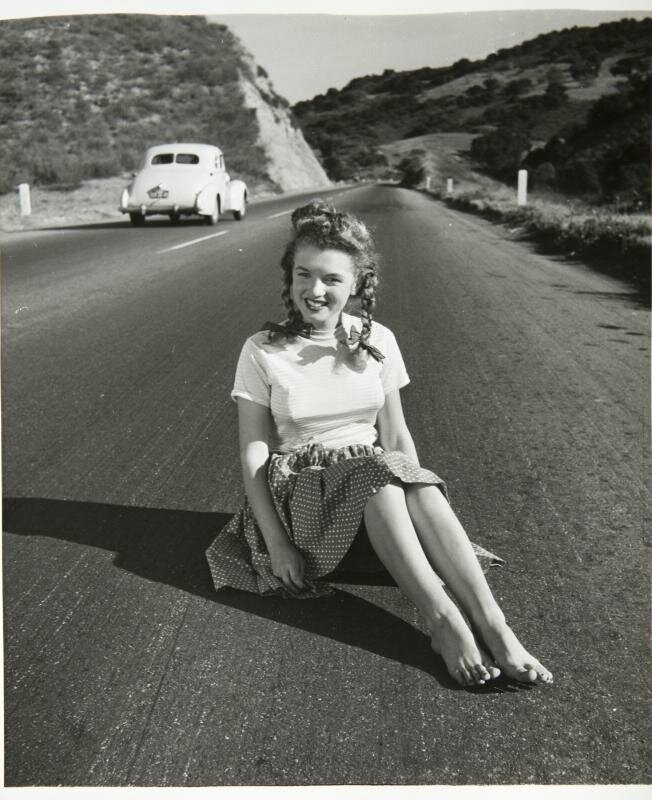 A vintage black and white photograph of Marilyn Monroe taken by Andre de Dienes in 1949. 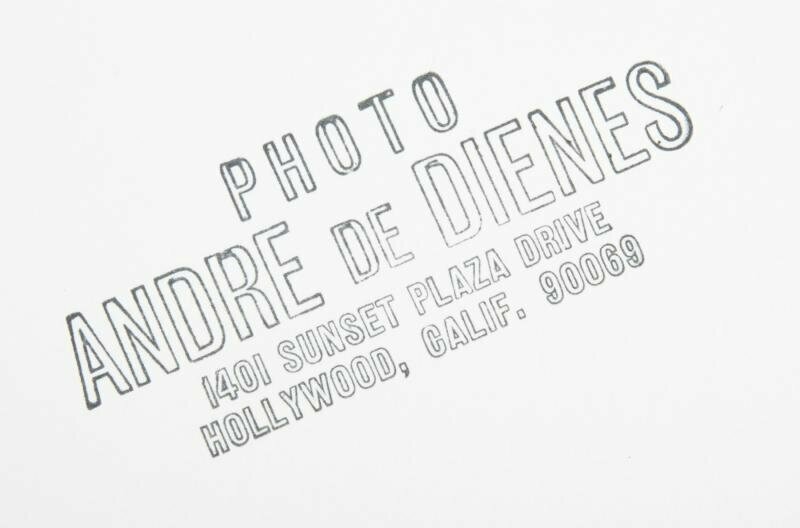 Photographer's stamp on verso. 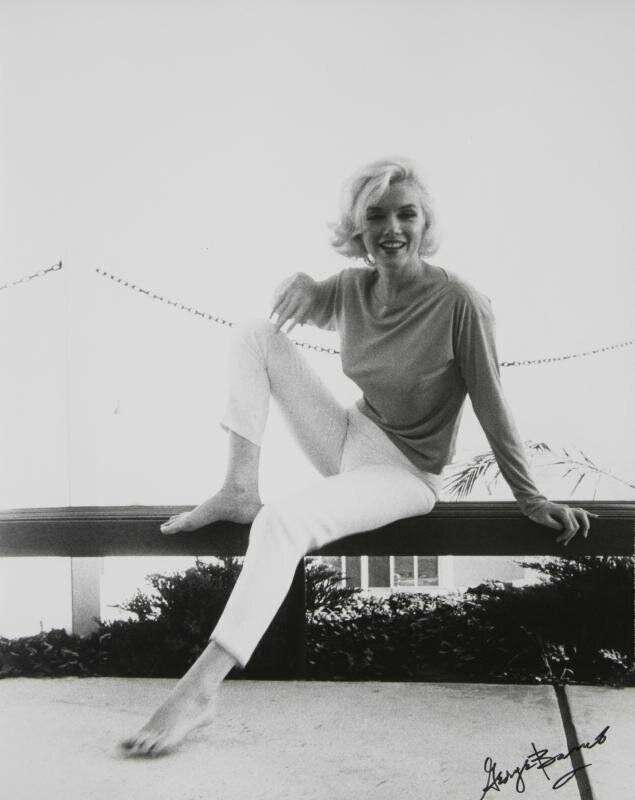 The photograph was hand printed and stamped by de Dienes. 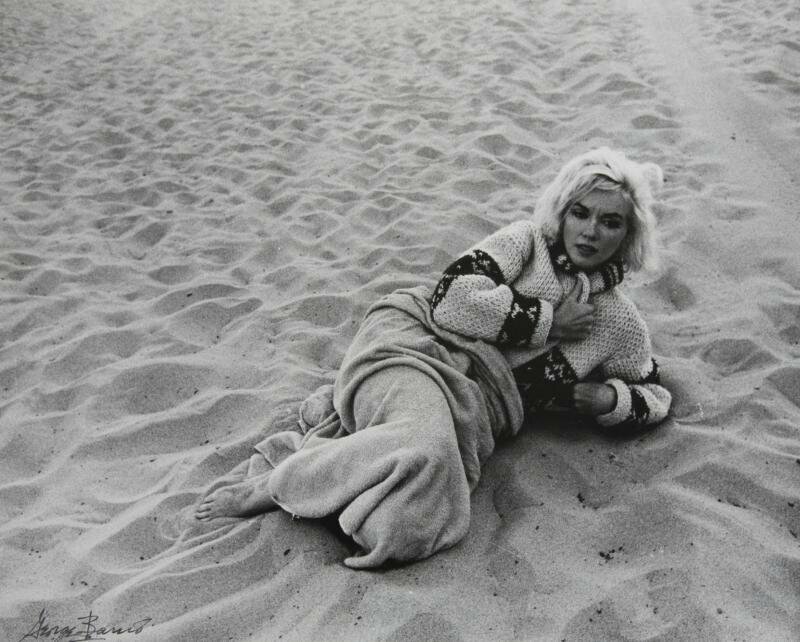 A black and white photograph of Marilyn Monroe taken by Andre de Dienes in 1945. 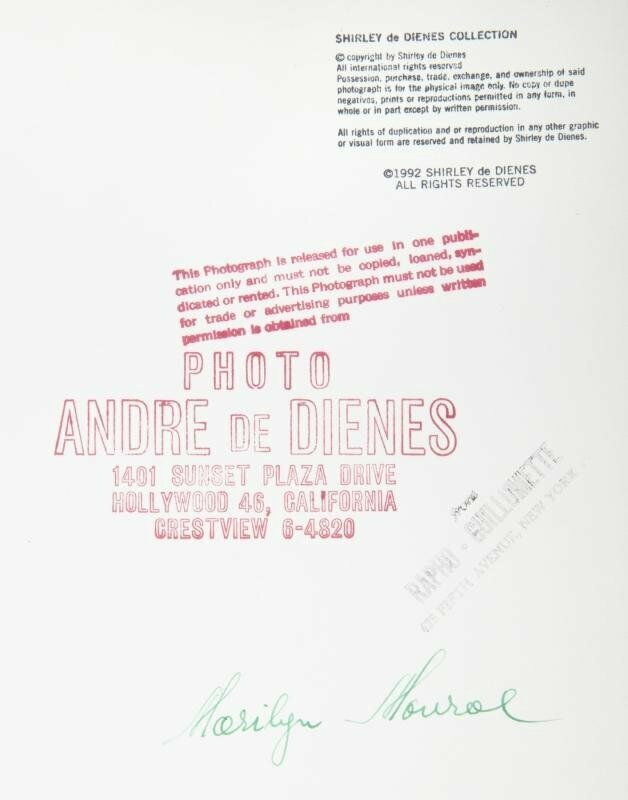 Numerous stamps on verso including the artist's stamp and a stamp for the Shirley de Dienes Collection copyrighted 1992. A black and white photograph of Marilyn Monroe taken by Eli Attar, circa 1960. 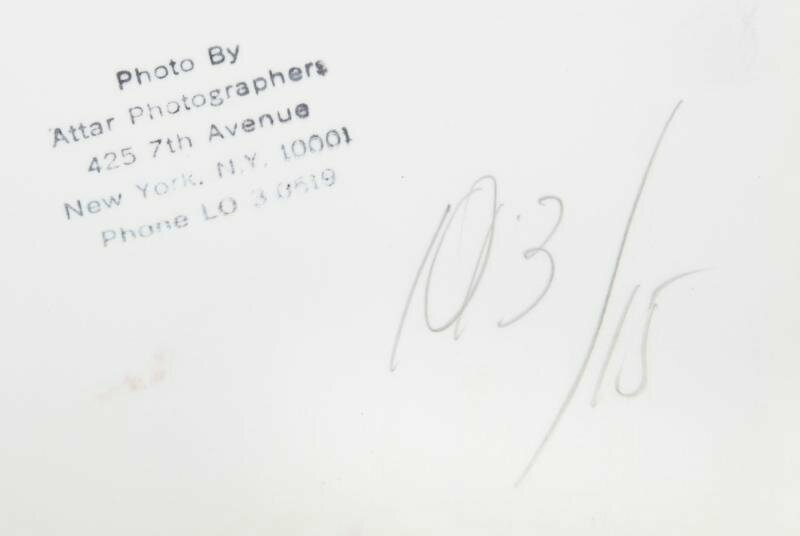 Photographer's stamp on verso with additional handwritten notations. 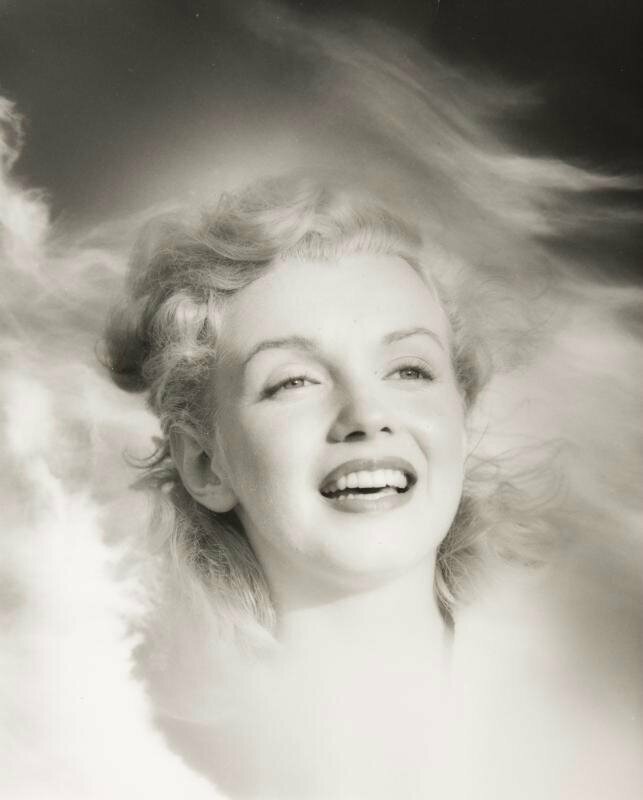 A vintage black and white double-exposure photograph of Marilyn Monroe taken by Andre de Dienes in 1949. 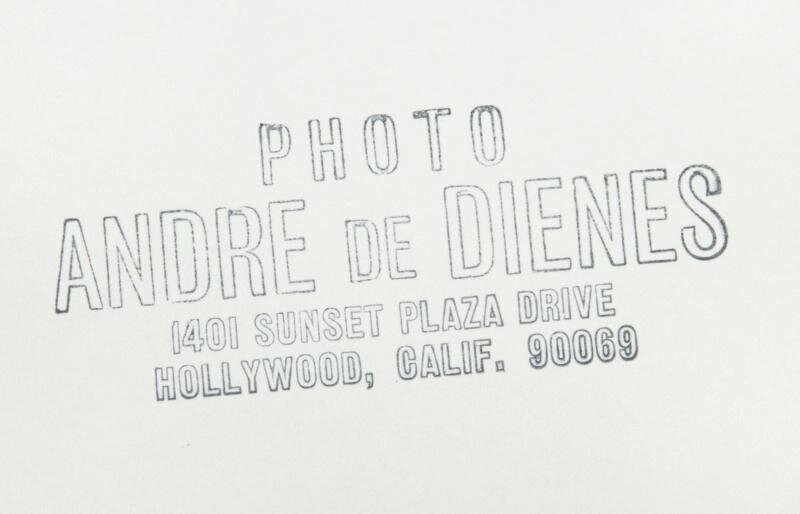 Photographer's stamp on verso. 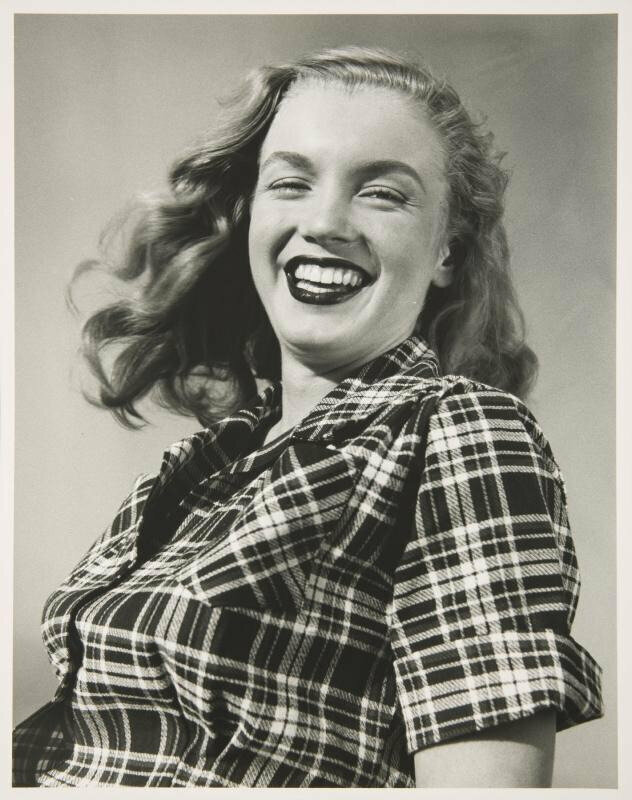 The photograph was hand printed and stamped by de Dienes. 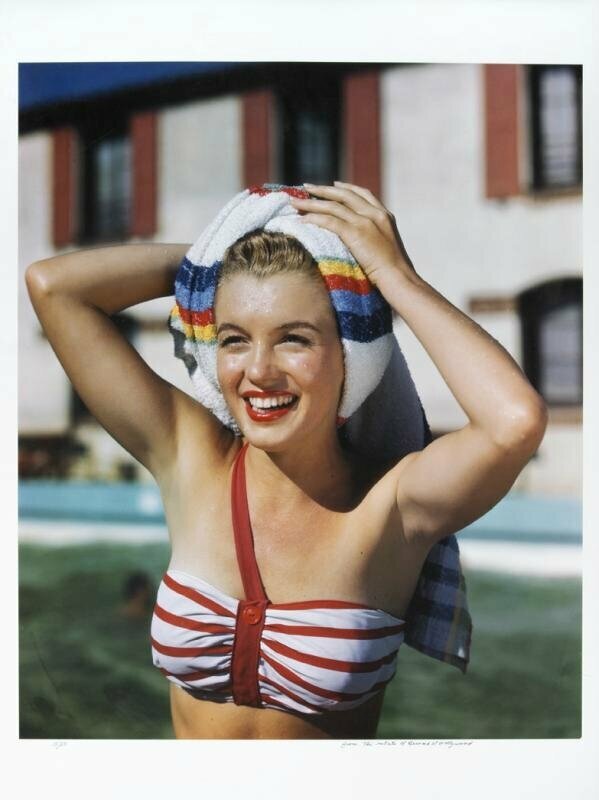 A limited edition color photograph of Marilyn Monroe taken by Bruno Bernard in 1948 at the Palm Springs Rocket Club. 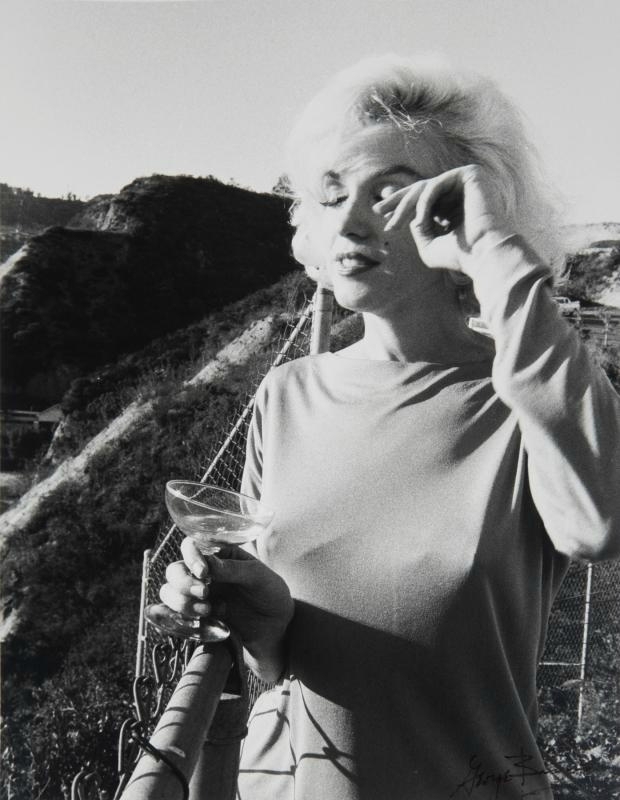 While at the club Monroe met Johnny Hyde, who was instrumental in getting Monroe her first studio contract. 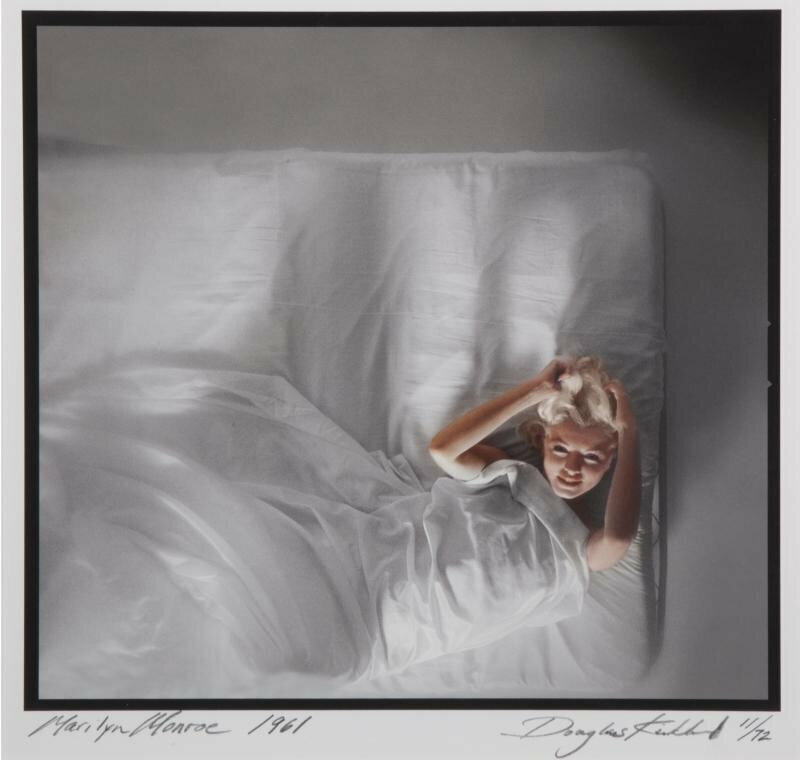 Estate signed and numbered 15/50. 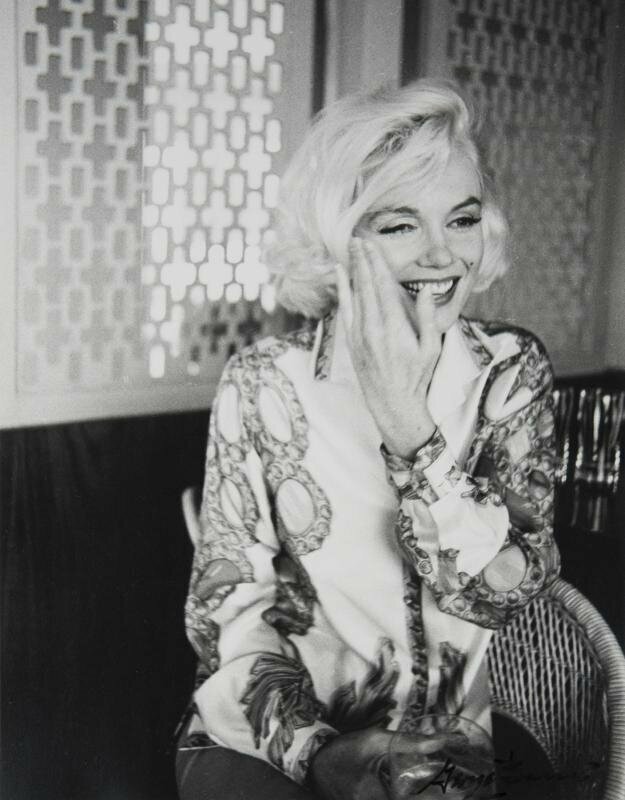 A limited edition black and white photograph of Marilyn Monroe taken by Bruno Bernard, circa 1952. 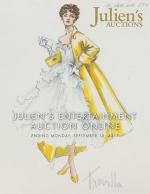 Estate signed and numbered 31/90. 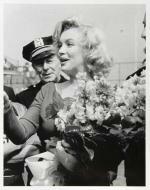 A counter check fully completed and signed by Marilyn Monroe. 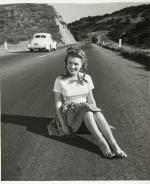 The check is dated February 16, 1952 written to Mr. Mrs. Checkhov [sic] in the amount of $15.00. 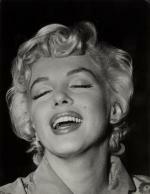 Michael Chekhov was Monroe’s acting coach in the early 1950s. 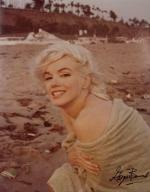 A Marilyn Monroe signed Marilyn Monroe Productions Inc. check dated May 14, 1960. 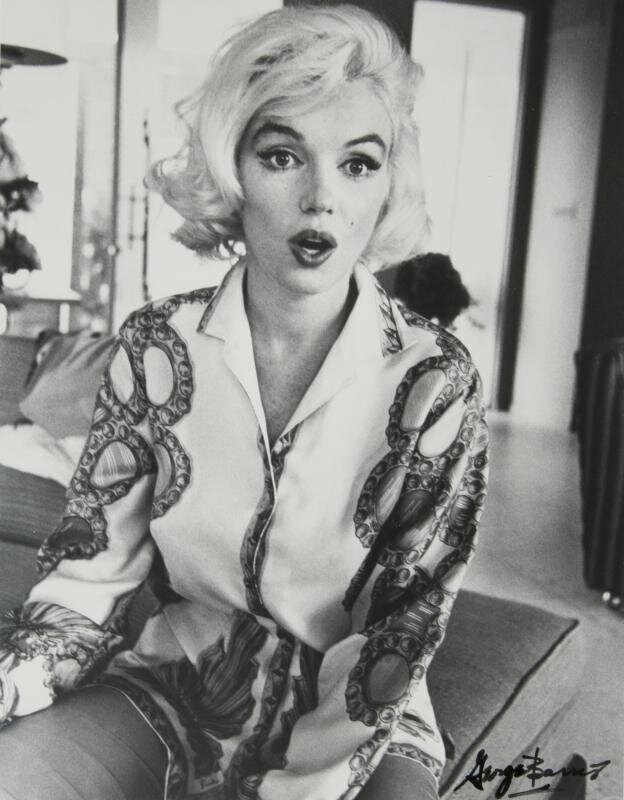 The typed check is written to the Moss Typewriter Company in the amount of $41.60 with a memo that the check was for the rental of a portable typewriter.